The life of the world’s greatest physicist can now be explored in detail at the Bern Historical Museum. A special section of 1000 square meters has been allotted to the stories of this brilliant scientist. This section of the museum has been named the Einstein Museum. Living in the city when he came up with the theory of relativity, the city has a lot to tell us about his life as, and outside a scientist. The exhibits here consist of a total of 550 artifacts including originals as well as replicas. They also have animations and around 70 films which tell us about the discoveries made, and the history of time itself. A great opportunity to view the world as it was during his time, you can be witness to some world changing moments and research. Enter the 1920s with your favorite physicist, here, at Einstein Museum, Bern. 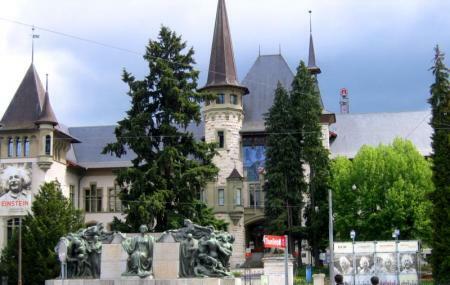 Apart from Einstein Museum, the Bern Historical Museum has a lot to offer, do take a stroll and explore it. Above ticket price is for the Einstein Museum for adults. Ticket price for permanent exhibitions is different. Refer to official website for details. Concessions are available, refer to official website for details. Open from 10 am to 5 pm on all national public holidays. Closed for Zibelemärit and on Christmas day. How popular is Einstein Museum? People normally club together Museum Of Natural History and Bern Historical Museum while planning their visit to Einstein Museum. Absolutely loved this museum. The EINSTEIN museum is probably the best part! Lots of information about Einstein's personal and professional life and also gives some history on the time period he lived in and the current conditions. There's also an exhibit on the history of Bern/Swiss inventions and history, that was super fascinating as a visitor to the area. This is an amazing place and you could easily spend hours and hours here. Fun, educational and immensely well presented. The route is numbered, so you know exactly where to start. The museum delivers on Einstein and the history of Bern. This is a must visit. If you are in Bern for a day, make the time. I must admit to having a bias, being a physicist, but with such a beautiful city, it would be a shame not to appreciate it fully due to ignorance that is so easily and gently rectified. This is home to a beautiful Exhibition on the life of Albert Einstein, one of the most fascinating characters of human history. The setting is typical of the old scenic splendour of Berne, and the exhibits are very absorbing. It is easy to spend a few hours here to learn about the personal history and the intellectual journey of discovery of the great man! Magnificent museum about the history of Bern, Albert Einstein and other artifacts from Egypt, north America and more. I'd recommend a full day there as in five hours I could only visit about 70% of the museum. A special mention to the stuffed cub which serves as a sorrowful memento of Bern during the tumultuous times of the French revolution. Just amazing! A section for bony fishes with their fossils. A section for synthetic sjeleton structures for not so ancient animals, but yet worthwhile. And ofcourse, a section for taxidermy. Overall, a great one time visit.